Joining us today is the critically acclaimed author Dawn Tripp, as she celebrates the release of her third novel “Game of Secrets” which is already a Boston Globe bestseller! This Harvard graduate has made her mark in the literary world with her intelligent, thrilling stories, exquisite writing, and vivid characters. 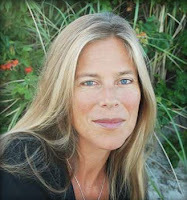 She received the Massachusetts Book Award for Fiction for her second novel “The Season of Open Water” and will no doubt receive further awards for her latest novel which is being hailed as her best yet. When she is not busy writing novel and contributing essays (featured on NPR and Psychology Today), Dawn teaches workshops on developing story arcs. Connect with her on Facebook, Twitter or her personal website. Dawn is here today to talk about some of her favorite movies and thanks to BookSparks PR, we have one copy of "Game of Secrets" for a lucky US reader. Every Indiana Jones movie—I am 100 percent geek, secretly obsessed with archeology, all things arcane, and vintage motorcycles. Indy is the spirit of all of that. The English Patient because the key aspects of the Ondaatje’s novel were transmuted by director Anthony Mingehlla in such a way that the story—the lives, secrets, and fates of the characters—breathe an entirely different life in the form of a film. If "Game of Secrets" were made into a movie, who would you cast in the lead roles? Sean Penn for older Huck and Zac Efron for Huck when he was just a fourteen year old boy with that James Dean kind of doom about him, driving fast down an unfinished highway in a stolen car, heat in his hands on the whale, because he loved a girl. Watching Lawrence of Arabia with my father. He had always loved that movie, and I remember when it was re-released and we went to see it together—just the two of us—and I felt in that theater sitting with him that I understood for the first time something profound about who my father was that I had not understood before. Wings of Desire by Wim Wenders. This film breaks my heart every time I watch it, for what it says about life and death, and the impossibility and necessity of love. 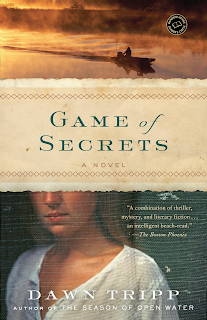 Thanks to Dawn for visiting with us today and to BookSparks PR for facilitating the interview and sharing "Game of Secrets" with our readers. Please tell us your most memorable experience involving movies or a movie theater. (One entry per person.) Please include your e-mail address or a way to reach you if you win. US only. Giveaway ends June 26th at midnight EST. Going to see a movie that was so terrible I actually left early. Rare for me. Honestly - I still remember being young and bawling my eyes out watching The Green Mile. I think that became the day that I realized justice was never served properly. It was heartbreaking and devastating. You think the world is perfect when you're young - and then you realize that things can be incredibly unfair. Congrats on the release Dawn. This book sounds really good. Sounds like a really interesting and juicy novel! Can't wait to read it! A memorable movie experience for me would have to be interestingly enough when I saw the movie Dodgeball. I know, doesn't sound like "cinema classic", but it was a full house, no one was expecting the film to be as funny as it was and just being in a room full of people you don't know but laughing til you cry together was just such a pleasant experience! Ever since I always make an exception for comedies and try to see them on opening night, so I can get that experience of shared laughter again! I'm very excited to see this book as a giveaway! A movie experience... had to be with the Exorcist. I was young and weren't allowed to watch it so we snuck down the stairs to see what was so taboo and we got to see the scene of her puking. We were already sneaking and this wasn't what we expected so we went back upstairs terrified not wanting to see anymore. i remember when ET first came out at the theater. it is one of the few movies i actually went to see twice because i loved it so much. later when vhs tapes became available; our first one we owned (and i still have it) was ET. btw; this book sounds like it would be a great read! For some reason, all of the really good movies, I fall asleep in. Like Evita, Last Tango in Paris, 2001 A Space Odyssey. So, I stopped going to movies. Left Bonnie and Clyde during the death scene. Just too much senseless violence. I went alone to a matinee to see 'Thelma and Louise' and left so moved and frustrated that I didn't have anyone to talk it over with at that moment! I loved reading both 'Moon Tide' and 'Game of Secrets', the beautiful prose is poetic and to be savored. Which reminds me that I have to go back to read 'The Season of Open Water'. For Christmas one year, my sister got the DVD "Napoleon Dynamite." No one wanted to watch it because we had no idea what it was about, but my sister made us, and we laughed so hard it hurt! We had no idea it would be so funny!! I remember the first time I stuck into a rated R movie as a 9year old. My sister and I went to see Spy Kids (a movie I wanted to see), then afterwards, she dragged me over to see Resident Evil...which creeped me out for days. And..I remember falling asleep with Lord of the Rings. I remember watching sitting in the front row of a crowded theater. It's hard watching a movie from the front row. My fondest memory is my cousin and I watching Rocky at our "Home Theater"(still open today) and she hiding her eyes and scared during the fight scenes. It amazed me. She loves to watch horror movies but cannot take real hitting or slapping.I loved the movie in 1976 and the sequels..she never saw another one. I remember feeling very sad when I came out of Bambi when I was a young girl. a group of us went to the movies following dinner...we asked our server for take out containers for dessert since we were running late. we realized after the movie was over that dessert was pie w/ ice cream. the ice cream melted all over the theater floor. we really felt bad for the person having to clean up our mess. thanks for the chance to read this fabulous novel! I remember going to see As Good As It Gets because it was my first date with my husband. Firs thank you for the great giveaway, this sounds like a wonderful book! The most memorable movie experience for me was going to see Dawn of Dead (the remake) with my big but more easily scared sister. I had my brothers zombie mask in tow and put it on after the movie just before the lights came on. Needless to say my sister was really really freaked out and I was rolling. I remember falling asleep during the Talking Trees scene in Lord of The Rings - Fellowship of the Rings. Guess the trees made me feel peaceful. Books sound awesome! Can't wait to read it! I went to see Finding Nemo with my parents and then 2 days later my 1st date with hubs we went to Finding Nemo! LOL Only me! I'm a corny Disney girl who loves reading all types of romances! Especially Chick lit! WHen I was young, my dad took me to a double feature...a Muppets movie and then Neverending Story. I was so afraid of the rock monster at the beginning of Neverending Story that we had to leave at that point. I went to watch Forest Gump when it first came out in the theater, and I remember thinking that it was the best movie I had ever watched. I went to an early screening of the 1980 film "Can't Stop the Music" and saw The Village People AND Phil Donahue there! I remember my parents would drop of my friends and I at the movie theatre when we were little and we'd watch movies all summer long.